About 2 months ago, Luca and I went to Monaco for the weekend. 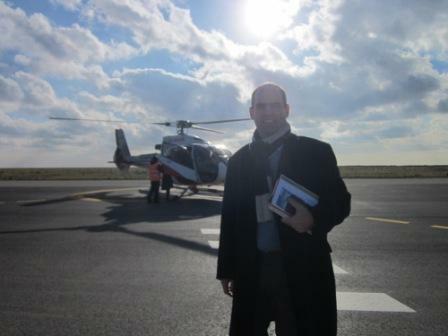 On the way there we first took a flight from Toulouse to Nice, and then a helicopter from Nice to Monaco heliport. This was our second ride in a helicopter after the first one in Brazil 2 years ago. In this post I just wanted to share the videos I filmed of the ride (find them below). This time the helicopter was an Eurocopter EC 135 (Eurocopter is an EADS company, same as Airbus, where I work). As we took a picture before getting on it, we didn’t have the best seats to shoot a nice movie. There is another shortcoming: since the heliport in Monaco Western than Monaco Ville and in the ride from Nice you are coming from the West as well, you don’t get to see all the sea-line of Monaco in the helicopter ride (the main port, Monte Carlo and the beach). Thanks for sharing this wonderful videos.